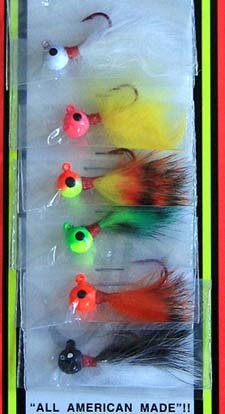 Rabbit Hair Jigs are here and have a great action in the water. Better action than the Flu Flu. Care and time has been taken to put together this little Panfish Jig. Utilizing Rabbit Hair with specially dyed consistent colors to match up with the forage in freshwater lakes. Six wonderful colors this year and more to follow. Three sizes 1/16, 1/32, and 1/64 oz Jig Heads on VMC Red Carbon Steel Jig Hooks will turn the heads of many a pan-fish. JB Lures only uses the finest grade of Rabbit Hair with controlled length and each and everyone is manufactured right here in Minnesota. Hand tied and double half-hitch knots are glued to assure hours of fishing pleasure with each and every Rabbit Hair Jig. A very special paint process allows most of the hook eyes to remain open for your convenience. Be sure to checkout the Black-White mixed hair color. Last spring it was my go to lure for ice-out and early Crappie Fishing, by far. What I really like about this little jig it is so versatile. Fish under a bobber, vertical jig or cast with an ultra light and use several different retrieves depending on the fish activity of the day. Fish the jig plain or use live bait or plastics.